Regency at Creekside is a 55+ community in Gainesville, Virginia. Residents enjoy living in the heart of Prince William County 30 miles west of Washington D.C. This upscale, gated community combines the rich history of this area with luxurious amenities and low-maintainance living. Residents can get to know their neighbors, stay in shape, become active within the community, and pursue their own hobbies and interests. Regency at Creekside is sure to appeal to discerning active adults who are looking for new homes in Northern Virginia. 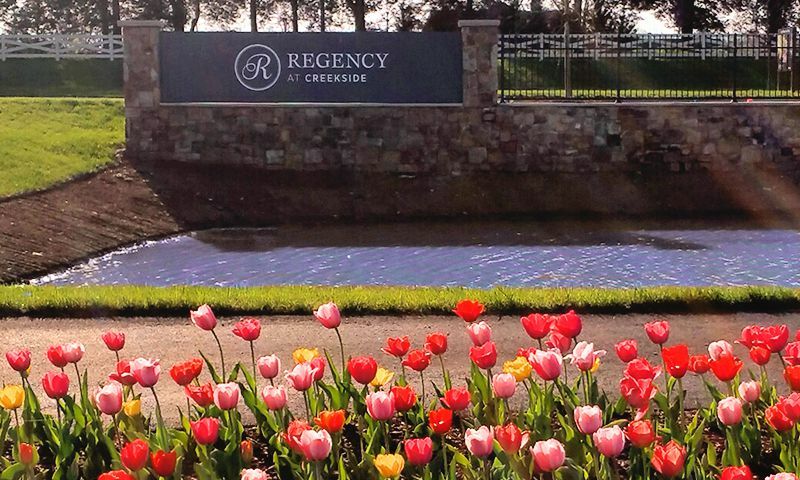 Proposed amenities at Regency at Creekside feature a 9,200 square-foot clubhouse. There will be a fitness center where active adults will find everything they need in order to stay in shape. There will also be an indoor pool for swimmers. A multi-purpose room will be convenient for clubs to meet for activities like cards or board games. Neighbors will have space to socialize and grab a drink inside the tavern. Outside the clubhouse, residents will have access to a sparkling swimming pool. Pickleball and tennis courts will also be available to challenge neighbors to a friendly game. Homeowners will also have opportunities to try to cut some strokes off their game using the putting green. For some fresh air, residents will be able to take advantage of the miles of walking and biking trails that wind throughout the neighborhood's scenic ponds. Construction began in 2016 on Regency at Creekside. Upon completion, this community plans to include 208 homes in various inspired designs and layouts. The Potomac collection offers three floor plans ranging in size from 2,551 square feet to 3,045 square feet. These homes include three or four bedrooms, three or four bathrooms, and an attached two-car garage. They offer master-on-main living with open floor plans and some models feature sunlit great rooms and large kitchens with island seating. The Middleburg collection also offers three floor plans ranging in size from 2,735 to 3,005 square feet of space. They include three or four bedrooms, three or four bathrooms, and an attached two-car garage. These models include large ground-level master suites with options for more traditional formal living and dining rooms, in addition to open flowing floor plans with grand entries and covered patios. Active adults will find plenty to do at Regency at Creekside. From swimming, pickleball, and tennis to various clubs and hobby groups, there is always something going on. An on-site activities director plans golf outings, cards and pickleball tournaments, and more in this gated neighborhood. You'll enjoy nights out with your friends in the dinner club, or meet up for drinks every Friday at the planned cocktail hour. There will also be fitness classes in the state-of-the-art fitness center and many holiday parties throughout the year. Located in Gainesville, Regency at Creekside enjoys a country setting that is still close to Washington D.C. The Linton Hall Road commuter bus stop is about ten minutes away which then connects to the West Falls Church Metro stop, making the trip into D.C under two hours long. While residents can appreciate all the shopping, dining, and cultural attractions found within the nation's capital, there are many attractions closer to home. A host of entertainment and events can be found at the Nissan Pavilion and the Wolf Trap Center for the Performing Arts. Shopping and dining is available in Old Town Manassas, at the nearby Fair Oaks Mall, or in the sprawling outlet center at Potomac Mills. Excellent healthcare is available at nearby hospitals, and those interested in continuing education may explore the programs available at George Mason University or Northern Virginia Community College (NOVA). Whatever you're looking for, you're sure to find it near Regency at Creekside in Gainesville, Virginia. There are plenty of activities available in Regency at Creekside. Here is a sample of some of the clubs, activities and classes offered here. The Potomac collection offers three floor plans ranging in size from 2,551 square feet to 3,045 square feet. These homes include three or four bedrooms, three or four bathrooms, and an attached two-car garage. They offer master-on-main living with open floor plans and some models feature sunlit great rooms and large kitchens with island seating. 55places.com is not affiliated with the developer(s) or homeowners association of Regency at Creekside. The information you submit is distributed to a 55places.com Partner Agent, who is a licensed real estate agent. The information regarding Regency at Creekside has not been verified or approved by the developer or homeowners association. Please verify all information prior to purchasing. 55places.com is not responsible for any errors regarding the information displayed on this website.